Time and again we hear the same story from small business owners – they are stuck in a rut, juggling too many things at once and unable to organize the various parts of their lives. When you look closer, everything seems to be right on track. Their businesses are doing well, their finances are in good shape, they have enough time to just relax and enjoy their families and activities. Yet they still feel they are staying in place, going through the motions each day. A commitment to action means you stop procrastinating. You stop putting off the hard decisions, the work that you really don’t like to do and the steps that are keeping you from moving forward. Try being stubborn with your business. Refuse to let the little things stop you in your tracks or slow you down. 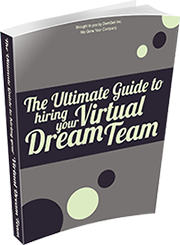 Get help with the jobs you don’t like to do, hire a remote team and let them help you get organized. Don’t quit until you’re finished. Self-defeating behaviours are those that keep you from doing what you know needs to be done. Ignoring your to-do list, letting less important things or those people who just want to chat interrupt your work, purposely finding something else to do so you can tell yourself you really didn’t have time to get to that item today. We all have behaviours we indulge in when we would prefer not to do something. Once again, don’t let yourself be distracted and hire help for the rest! Getting out of a rut, changing ourselves and as a result, our business, can give us more energy by reviving our interest in what we are doing and shaking us out of the same old boring path. Do it one step at a time, choose your optimal plans, gather all of your necessary resources and don’t make it harder than it has to be.